The M.V. 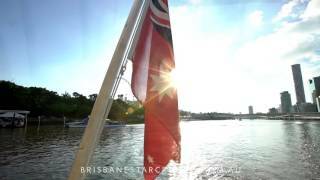 'Brisbane Star' is a fun and flexible boat that operates private cruises customised to suit any occasion, party or event, exclusively for you and your guests of up to 110 passengers in comfort. They offer many catering options, live music or a DJ, a fully licensed bar (at regular prices), a covered top deck to see the sights, an awesome festive atmosphere and of course fantastic crew giving great service. They are all about making sure that your celebration with them is the best party cruise ever! Weddings, Parties, Anything ... You're Welcome Aboard The Brisbane Star! They offer a delicious range of menus, or you're welcome to self-cater (not available November and December). The Brisbane Star is fully licensed and charges public bar prices. A bar tab is available or guests may purchase their own refreshments. Bring your own is not permitted. The four hour cruise includes Captain's commentary, morning tea of warm scones, jam and fresh cream, light lunch of freshly cut sandwiches and all day coffee and tea. At Newstead House, a guided tour of this beautiful property - Brisbane’s oldest surviving home, is included in this cruise. This four hour cruise includes Captain's commentary, morning tea of warm scones, jam and fresh cream, one hour guided tour of Newstead House, light lunch of freshly cut sandwiches and all day coffee and tea. This five to six hour cruise includes Captain's commentary, morning tea of warm scones, jam and fresh cream, one and a half hour guided tour of Fort Lytton, light lunch of freshly cut sandwiches and all day coffee and tea. The cruise ventures as far as Seventeen Mile Rocks where you'll turn and head downstream to Southbank. This four hour cruise includes Captain's commentary, morning tea of warm scones, jam and fresh cream, light lunch of freshly cut sandwiches and all day coffee and tea.